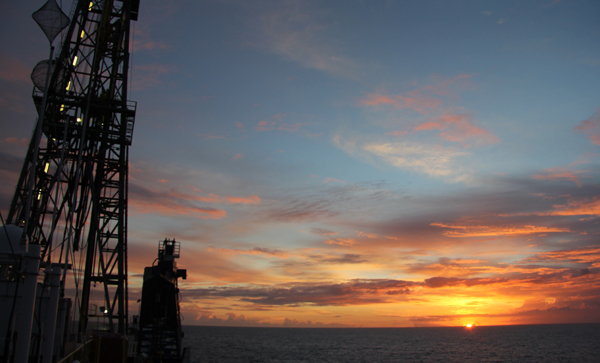 IODP Exp 342: Core on the Floor! Nearly all of the geological field work I’ve done up to now has been on outcrops, rocks exposed at the surface. I’ve also done quite a bit of work on cores taken from the subsurface, which are stored in a repository and then laid out for geologists to view, describe, and sample. 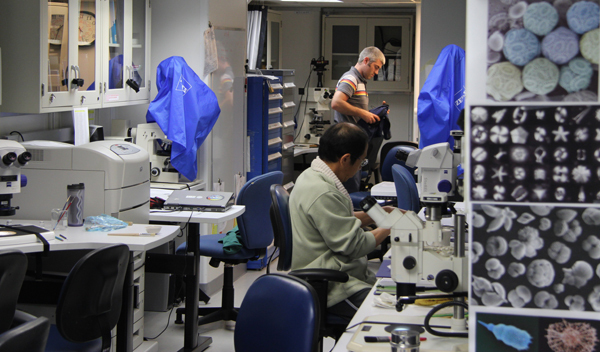 Working on the JOIDES Resolution is like being in the field and the core lab at the same time. Every hour or so during coring operations there’s an announcement that goes out across the ship saying ‘Core on deck’ or ‘Core on the floor.’ What I love about this is that it’s all about the core. Getting the material that holds clues to events and conditions of an ancient Earth is the primary objective. The core techs processing a core that just came on deck. 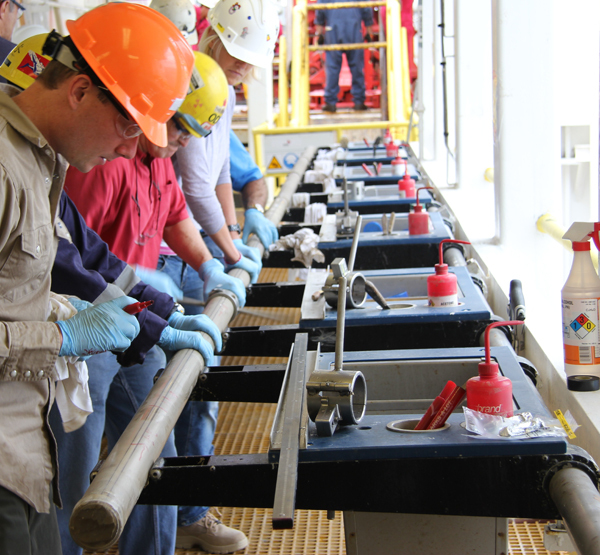 The science party starts analyzing the cores the instant they are transferred from the drilling floor to the catwalk. Samples are immediately taken from the core catcher, the very bottom of the ~9.5 m (~30 ft) long core, by the paleontologists who begin the work of figuring out where the core is in geologic time. Not all sediments contain the microscopic fossils that are useful for age determination, but they are all checked. The full core is cut into 1.5 m (~5 ft) long sections that are brought into the lab and run through a series of machines that measure physical properties of the sediments or rock. The core sections then rest a while – typically, a couple hours – to get to room temperature. The sections are then split lengthwise into two halves, either using a cheese cutter-like device for soft sediments or various saws for hard rock. One half is called the ‘working’ half and is the one sampled for geochemistry, paleomagnetics, and additional paleontology. The other half, called the ‘archive’ half, goes to a separate table to be described in detail. I’m part of the core description team and will go into more detail about that process in a future post. Finally, as you may know, we have a videographer and documentary film maker on board for the two-month expedition. He’s making episodes as we go and putting them up on Ocean Leandership Consortium’s YouTube channel. There will likely be about five total episodes with a synthesis film produced after the cruise. Here’s the first episode, it’s about 10 minutes long, enjoy! ← Expedition 342 has begun! You have my dream job Brian- mud, radiolarians, the sea & sunsets. That’s serious awesomesauce right there! I bet you end your days like the most interesting man in the world commercial; “I don’t always drink beer, but when I do, it’s Dos Equis.” :) perfection. Nice little discussion on the seafloor around the Titanic. I like the series, gives me a feel for how life out on the JR can be. Looking forward to episode 3. One question though, what’s with the Elmo?